Have you heard of brookies? If you’re unfamiliar, fear not, because we are going to get down to the nitty gritty in today’s #monthofchocolate installment. 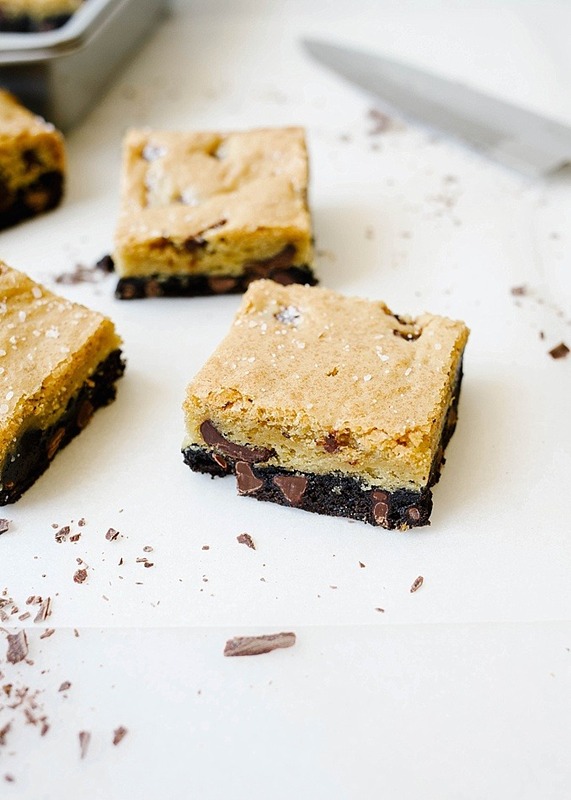 Brookies are essentially brownie cookie bars, a treat that is equal parts chocolate chip cookie dough and brownie batter. 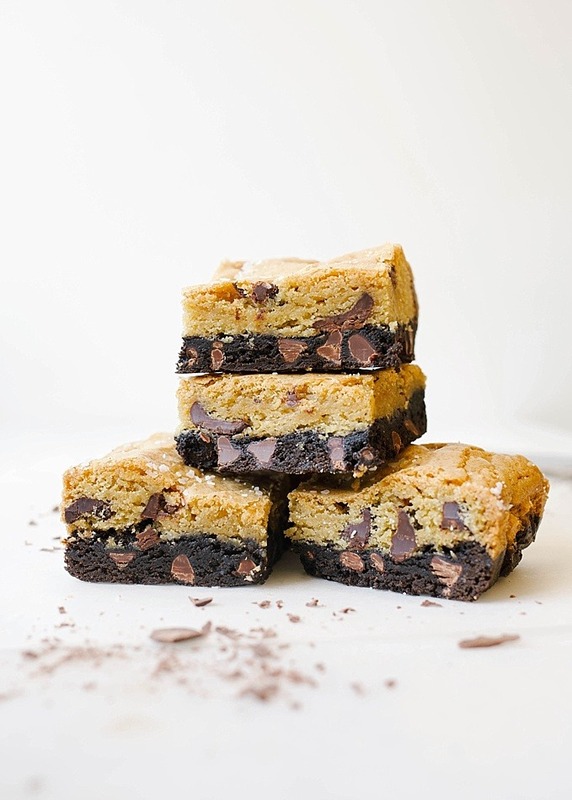 Both components are baked into one ultra-rich and satisfying dessert, the ultimate treat for the chocolate lover who refuses to choose between chocolate chip cookies and brownies. My experience with brookies began as a kid. Growing up, my Nana and I would take day trips to the next town over where we would shop for books and eat lunch. We’d spend hours thumbing through stories and magazines, acquiring stacks of paperbacks and colorfully illustrated pages to take home for keeps. Any vacation to visit my Nana was incomplete without an outing to that bookseller, and I firmly believe that my love for reading and writing began in the quiet corners of that store. Shopping was always followed by lunch, and we’d visit the same restaurant each time. In keeping with our tradition, dessert was ordered first, and we would fill our bellies on slices of banana cream pie and brookies served with scoops of ice cream. Occasionally, we would save room for lunch, but the beauty of those meals was the space to do something that felt out of the ordinary and special. That act of eating dessert first became like a sacred right, a privilege reserved for meals spent across the table from my Nana. A sidetone on this: do you guys have memories like that? Are there people in your life who have created those moments for you? I think some humans have a knack for making ordinary days and places and moments sparkle. 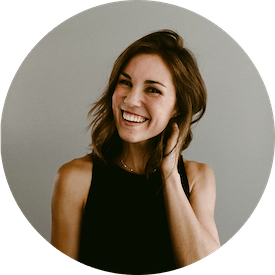 They thrive on creating magic for others and have the seemingly innate ability to make the everyday memorable. In a long list of qualities that I hope to inherit from my Nana, this is one: I want to create meaning from the mundane. I want to be a person who can polish life’s simple moments until they become someone’s treasure. In retrospect, the brookies we enjoyed all those years weren’t that great. You could kinda tell it was one of those mass-produced desserts that was microwaved at the last minute and served a la mode. 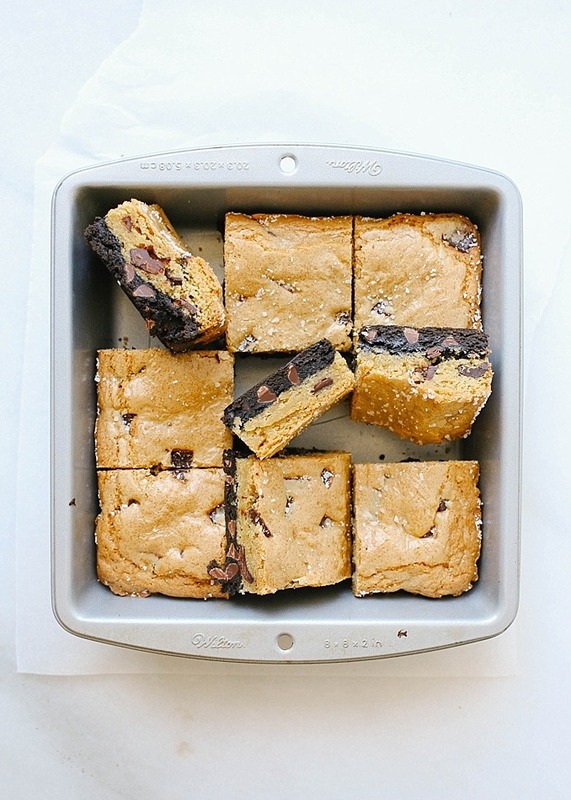 But the prospect of greatness is still there- a brownie and cookie combined?! Could anything in the world be more tantalizing? 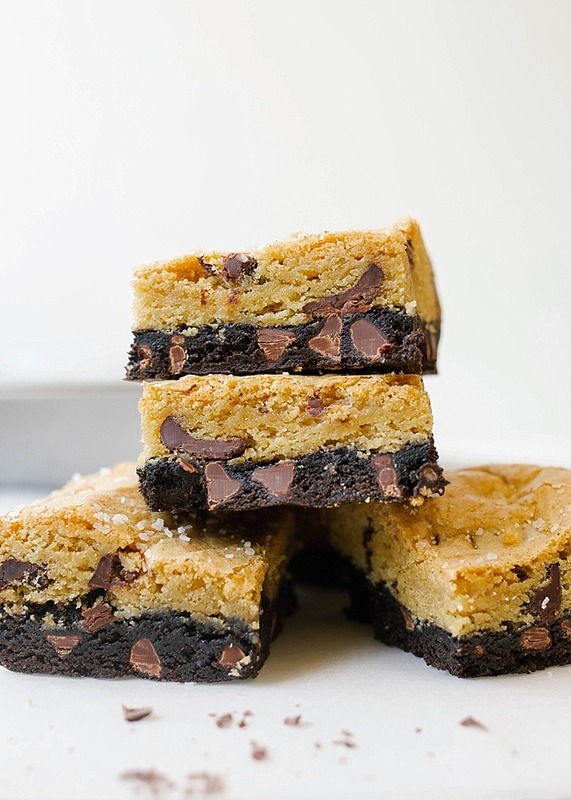 These brookies are made from a simple cocoa powder brownie batter that is topped with an equally easy chocolate chip cookie dough. The recipe can be prepped in ten minutes flat, yet has that “OH MY GOSH, WHO BROUGHT THESE?” kind of a effect on the people who eat them. They’re just that fab. To make them, we start with the brownie batter. Melted butter is stirred with sugar before a single egg and some vanilla are added. Flour, leavening and cocoa powder are added next, and a fold of chocolate chunks completes the batter. Spread the brownie goodness into the bottom of a 9″ baking dish and get started on the cookie dough. Again, melted butter and sugar are stirred together before an egg and vanilla are added. The dry ingredients and chocolate chunks are stirred in next, and the dough is spread in on top of the brownie batter. A sprinkle of salt finishes the bars, and the whole pan gets baked in the oven until they have puffed and baked through. 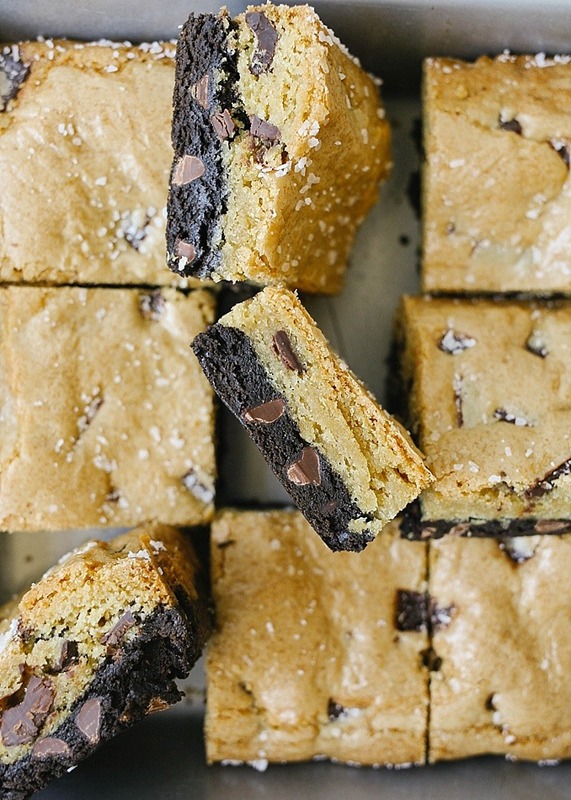 Fresh from the oven, the brookies are cookie in texture and ultra-chocolatey in flavor. They’ll store terrifically in the freezer, but my guess is that they won’t last that long. Give them a try and let me know what you think! Next week is our very last week of #monthofchocolate (BRB, I’m actually crying real tears), and we will celebrate with two desserts. Don’t worry, I’ve totally saved the best for last. Happy Tuesday and Happy Baking! 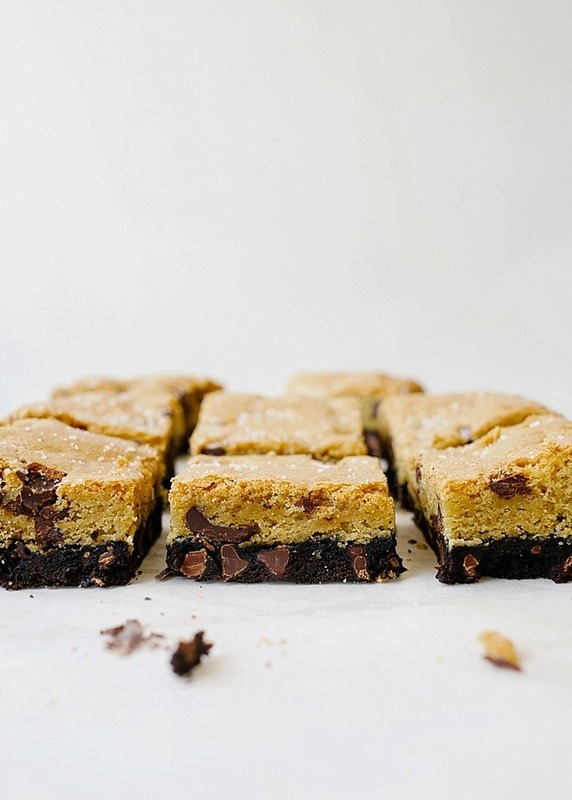 These brookies are brownie cookie bars- a layer of brownie batter topped with a chocolate chip cookie dough! This simple one-bowl recipe is perfect for the person who just can’t choose. Preheat the oven to 350 degrees and line an 8 or 9” square baking pan with aluminum foil. Lightly grease the bottom with baking spray. Melt the butter over medium heat until just barely melted. Pour into a medium-sized mixing bowl and whisk in the sugar and brown sugar. Whisk in the egg and vanilla. Add the flour, cocoa powder, and salt and stir with a wooden spoon until almost combined. Add the chocolate chips and stir until the ingredients are well incorporated. Spread the mixture into the bottom of the prepared pan. You can use lightly moistened fingers to pat it out evenly. Melt the butter over medium heat until just barely melted. Pour into a medium-sized mixing bowl and whisk in the sugar and brown sugar. Whisk in the egg and vanilla. Add the flour, baking soda, baking powder, and ½ teaspoon salt and stir with a wooden spoon until almost combined. Add the chocolate chips and stir until the ingredients are well incorporated. Spread the mixture on top of the brownie layer. Sprinkle the top of the cookie with the remaining ¼ teaspoon of salt and then bake in the preheated oven for about 35 minutes or until a toothpick inserted just barely comes out clean. Allow to cool on a cooling rack for about 20 minutes before pulling the aluminum foil and bars out. Once cooled, slice into squares. The picture looks like you sprinkled Kosher salt on the top. Is that what you used for the recipe or just the tops of the brookies? Can’t wait to try these! 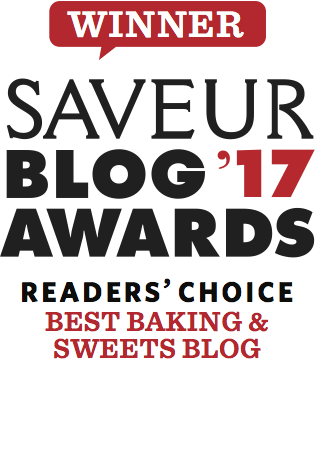 Coarse sea salt, fleur de sel, or Maldon flakes would all be perfect additions! These are delicious! thank you for the recipe! hooray! I’m so glad you enjoyed!!!! Glad to see the short baking time on this. I saw another recipe that took up to 50 minutes! Will be bringing these to our annual summer block party. I know it will be a big hit. Oh, I do hope you’ll enjoy them! Oh, I’m thrilled to hear this! Thank you Tasia! For the “dark cocoa powder” is that unsweetened cocoa powder or something different? It’s actually dark. You may also see it called dutch processed cocoa. 🙂 you can use regular but the taste and appearance will vary. I fixed this for my supper club and they loved it. I served it warm with a scoop of vanilla ice cream, a drizzle of caramel sauce, a drizzle of hot fudge sauce, and a sprinkle of pecans. Thanks for making me a success. ugh, I am THRILLED to hear this! I love how you served it– what a great idea! I baked a batch of these when I was supposed to be working on homework, and they were well worth the procrastination. 🙂 Such a fun flavor/texture combo! I’ll definitely be making these again. Brookies!!!! Love it. I’ve never had one so feel like that needs to change asap. I do love those easy slice/bar recipes that you bring along to uni/work or to a shared lunch/potluck and everyone falls over themselves to get a piece….layers are always a go-to way to impress haha! Your brownies look mouthwatering. I’m not a brownie lover, but my husband and son love them. My son saw your picture on Instagram and now they are on my to-do list for this weekend. I made these for a Mardi Gras party yesterday and they were a hit! Thanks for sharing! Agh! I’m thrilled. Way to ring it in!! I’m the only grandchild that my grandmother learnt how to make pancakes. And the only one she took to watch the holiday on ice show. What a sweet story about your Nana. I love that you created a dessert that reminds you of those special times. I have similar memories of my grandfather, who took me every year to an art museum in the “big city” near us. Before going to the museum, we always ordered steak for lunch at the same restaurant, even though I hardly ever ate steak otherwise. I believe my appreciation for art began with those special trips. Your Brookies look amazing! See, I love that. I love that you’re able to associate a tangible (steak!) with someone you love. What a gift that is! Happy baking to you and thanks for saying hello!